These workmen are installing cast-iron bollards to stop nurses from parking on the pavement outside the Royal Hospital in Belfast. They are cleaning up at the end of the day, can you spot why they won't be getting off home anytime soon? 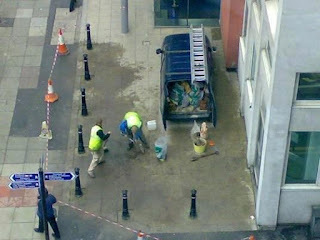 Ohh Bollards!" I think they'll have a longer evening than they expected.